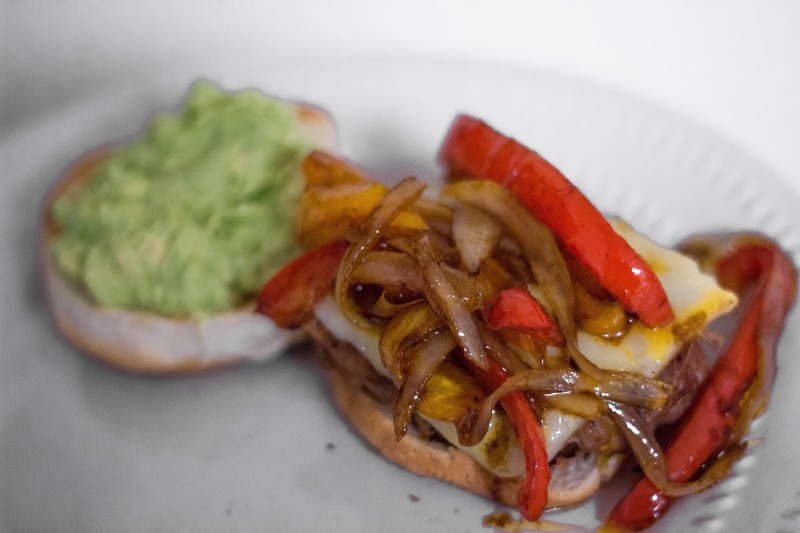 Tasty Tuesday: Fajita Turkey Burgers | For the Joy of Life. Okay, so this recipe doesn't have to be made with turkey... but I've had a recent fascination with ground turkey since it's a little better for you than ground beef and I can buy it in bulk at Costco! I pretty much replace ground beef with ground turkey in most of my recipes now and hardly even taste a difference! Fajitas are one of our favorite meals and we LOVED having that same taste on a burger! Hunter made himself sick he ate so many of these, ha! It was super easy and super yummy, I call that a win, win! -Place uncooked ground turkey or ground beef in a mixing bowl. Add half a packet of fajita seasoning, 1 tbsp garlic salt, 1 tsp chili powder, and a few dashes salt and pepper. Once mixed completely, form meat into burgers and cook in a pan with some cooking spray or on the grill! 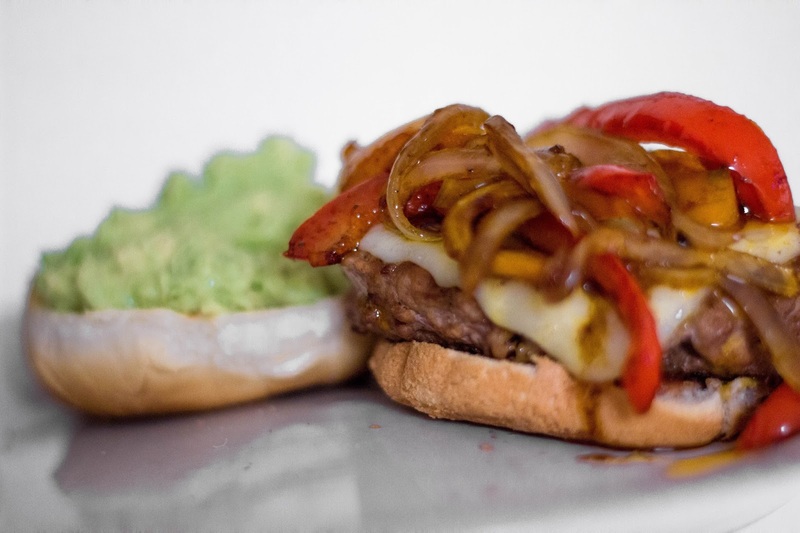 -While burgers are cooking, start cutting your bell pepper and onion into strips. Add that to a frying pan with oil and let cook until veggies become soft but not soggy. -Turn heat to low and add in the remainder of fajita seasoning, 1/2 tsp chili powder, soy sauce, and a few dashes salt & pepper. Let that cook for a couple more minutes. -When burgers are almost done add slices of pepper jack or Monterey jack cheese and let it melt down. -Make your guacamole by adding the meat of two avocados to a mixing bowl with sour cream and a few dashes garlic salt. If you wanna get fancy, skip the sour cream and use fresh pico and lime juice. -Toast your bun. The add a spoonful of your fav salsa to the bottom bun. Place burger on to of that. 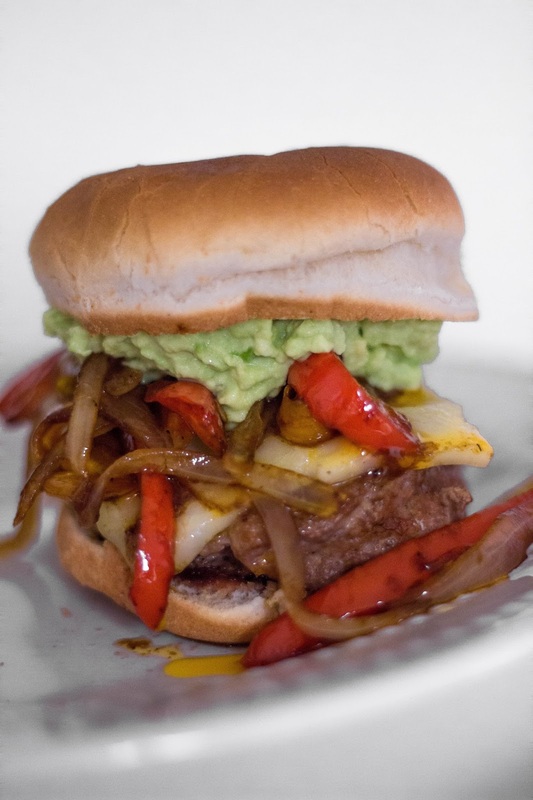 Add peppers and onion on top of the burger. On the top bun add a heaping spoonful of guac. And there ya have it, the fjaita burger! I hope you all liked this recipe!